How perfect to find an ethical fashion accessory brand, especially one that's all about investing in women and girls, providing the women with fair work and, with the sale of each item, adolescent girls receive life skills mentoring. 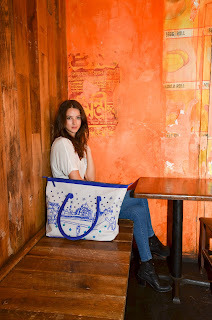 Also, it's so perfect that, planning to visit India in the fall, I found out that this company, Catrinka, which I originally wrote about months ago, is now selling the Kanta Weekender, a 100% cotton canvas bag with a hand drawn Indian street scene embellished with hand embroidery and mirrors. So many of my activities, whether it's mentoring seniors at Barnard College where I did my undergraduate work or creating a fashion and accessories line, revolve around working with women and girls. 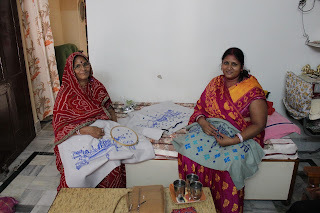 Catrinka whose motto is "buy a bag, employ a woman, educate a girl, fits right along with this sensibility.